Introduction: Anaphylaxis is widely accepted to be an increasing problem worldwide. 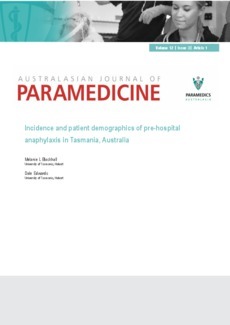 This inquiry into pre-hospital incidence and patient demographics is useful to determine status of anaphylaxis in Tasmania. Our main goal was to determine the incidence of pre-hospital anaphylaxis in Tasmania and identify trends in characteristics of affected patients. Methods: Raw data was searched and extracted from Ambulance Tasmania electronic recording system and case records for the period 1st January 2007 to 31st December 2011. This involved data mining 279,482 cases with the search parameters of anaphylaxis and allergy/ allergic reaction. Results: There were 1,570 patients were classified as having allergic reaction (including the most severe form of anaphylaxis). 379 (24.1%) of the atopic group were given a final primary diagnosis of anaphylaxis. The adult cases distribution was female at 219 (57.8%) versus males at 160 cases (42.2%). Interestingly 21.1% of the total anaphylaxis cases were paediatric (n=80) with a greater percentage of male (n�=� 46) to female (n�=� 34) paediatric patients. Aetiology was identified in 85.5% of the cases accordingly: envenomation (insects) 141 (37.2%), food 118 (31.1%), medication 58 (15.3%), known other 4 (1.1%), exercise 3 (<�1%). Sixty-one patients (16.5%) had anaphylaxis from an unknown aetiology. Almost two-thirds (61.9%) of the cases were from southern Tasmania. Conclusion: These findings suggest that almost a quarter of all calls for allergy or allergic reaction are of a severe potentially life-threatening nature, with the most common aetiology envenomation from insects (jack jumper bites).